Enjoyed the pint of ESB which I had here last night. Didn’t enjoy paying around £4.30 for the privilege, though. Large Fuller’s pub which was relatively quiet inside on a busy Thursday evening compared to surrounding boozers where people were spilling out into the streets. Staff friendly and efficient, toilets clean and you could get a seat, but would be put off returning by the price. Fullers is not my favourite beer but after half hour of being squashed on the underground I would have drunk lager.............no, not really. 6:15 on a Thursday evening, nearby Hamilton Hall was 'rammed'. Dirty Dicks was guarded by twenty smokers blocking the entrance and Woodins Shades had no spare tables, so here we are. It was busy but still had enough room at a table for the three of us. Our food was served within 20 minutes after ordering. I had the ham and leek pie - which did contain more air than filling. The vegetables were cooked soft (the way I like them). Rounded off with chips and gravy it was very edible. I did wash it down with pints of Chiswick Bitter (very watery), Ascot (slightly better), ESB (good) and Discovery (the best). Not bad for someone not keen on Fullers. Crowded train journey home? I couldn't care less now. A shame that Beermonster's food ruined his experience. I have been using this pub off and on for 7/8 years now and never had a bad time - beer always decent. Although I cannot really comment on the quality of the food (only ever eaten a sandwich one lunchtime) it always seems popular for food at lunchtime. Staff are polite (mostly eastern Europeans - thankfully) and generally pleasant. The place always looks clean and tidy and frankly it is better than Woodins by miles - different league. I suppose it is "corporate" in that it is run by a brewery but a brewery that seems to know what it is doing nonetheless. 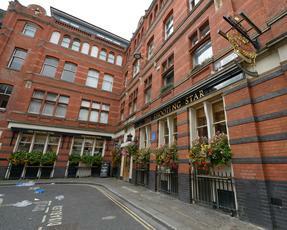 Some of the non-brewery pubs in and around the City can be complete dives. SS is a reliably good pub - a 7/10 is fair in my opinion.